At 12degrees 18min South, 168degrees 48min East the remains of a volcanic crater rises out of the South Pacific Ocean. Tikopea - 6 square miles comprising volcanic rock, rich soil and white sand beaches - a hot and humid climate with daily temps of 26.7C to 29C. 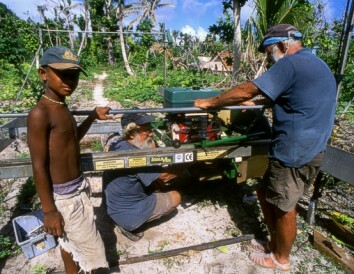 This paradise was to feel the full force of nature's wrath as Cyclone Zoe approached the islands of Tikopea and Anuta on the morning of 28 December 2002. Zoe was rated as a category 5 cyclone, with winds exceeding 325km per hour. From the Saturday morning till midday Monday, Zoe's track was stationary to the east of Tikopea. 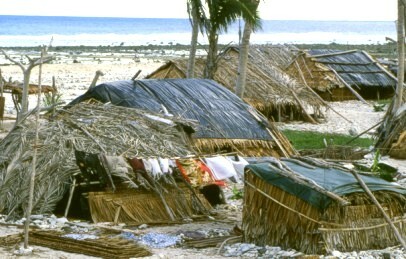 Words cannot convey what it must have been like for the people huddling in their sago-palm roofed houses. The noise of the wind would have been deafening - like the roar of many jet engines. Incredible seas rose to 15-17 metres, pounding the fringing reef to rubble and depositing its load onto the windward beach. 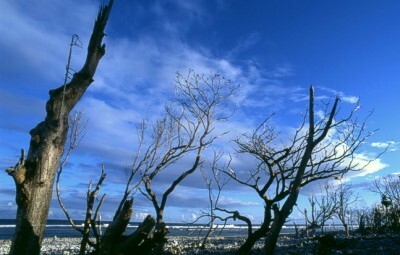 Geoff Mackley, the New Zealand reporter come adventurer chartered a light aircraft, and was the first to sight the island, taking photos of the devastation and a few people on the beach and around the lake. Comments from some people said - "People are fishing and look happy". Geoff then said "False - actually they are fishing to find any possessions, as everything was either blown out to see or into the lake." On 5 January Geoff again returned to the island, this time in a Jet Ranger helicopter from Vanuatu, chartered by the Australian newspaper. All available space was crammed with 2 minute noodles - the only light foodstuff he could find. Incredibly, at this stage the world was to learn that no-one had died on either Tikopea or Anuta. At this point of time, as you all are aware, the phone lines became busy in Australia, as many of the ex-crew members of Eye of the Wind contacted me to see if anything could be done to help them and repay some of the friendship and hospitality we had been shown on our 5 visits there. After discussions with John and Jan Nicholls (who had a catamaran 'Tofua' which had sailed there a few times) and also Gina Yates who had been there on 'Tara', we decided to try and organise a relief effort. It took quite a few weeks for everything to get into gear, and for the goods to be collected and stored at Rod and Stella's studio in Newtown. Whilst I will be mentioning individual people later, it was a great effort on everyone's part - those who collected, delivered and packed the mound of clothes, towels, pots and pans, toys, sports equipment that were donated - often by people who had never been to or heard of Tikopea. It was not without its moments as well - like on the final day of packing when the last box was sealed, Patti mislaid her bag with her birthday presents, keys, wallet etc. So there we were, trying to remember which were the last boxes packed, opening them up and looking for it. Luckily before too many were searched, it was found in the back of her car. Poor Ted nearly tore his hair out trying to organise the cargo manifest - it became particularly difficult for him as more and more items kept arriving to be squeezed in. His wonderful effort made it so much easier for us at the Fiji end. I would like to thank Steve for his time and his truck, as he moved the container from the yard to Newtown so we could load it, and then drove it to the wharf to be loaded on the ship. Many thanks to Owen for picking up the tab for the cost of the container transport - this was a very last minute stroke of luck for us that he became involved. It was a great relief when we heard that Don and his vessel 'Scotsman' had arrived in Lautoka after his crossing from New Zealand. The morning of 7 May found us alongside the island shipping dock in Lautoka, Fiji. 2 containers faced each other - doors open on the wharf. One contained all the packages we had sent over - the other was to take off the miscellaneous gear out of the 'Scotsman's cargo hold. As loading commenced Ulla (our German camera lady) arrived on the wharf to start filming what ended up being 18 hours of video, and over 1,500 still photos. After seeing everything in the warehouse in Newtown, I was extremely surprised that we managed to fit it first into the container for shipping, and then into the hold of the vessel. After last minute purchases of extra tools, fabric, pipes, seeds, fish hooks, tobacco (for the Chiefs) and drums of fuel and oil, we departed Lautoka on Sunday 11 May for the 4 day passage to Tikopea. The trades were light, so we comfortably motor sailed pretty much all the way. In the predawn greyness, the silhouette of the island was visible on the western horizon. As we approached and skirted the windward side, our eyes could not believe the havoc which cyclone Zoe had caused. On anchoring in Ringdove Anchorage on the leeward side, the Honourable Walter (democratically elected by the people to be the island's representative) and John (Chief Edward's oldest son) paddled out to greet us. Ulla and I went ashore while Don looked after the schooner. 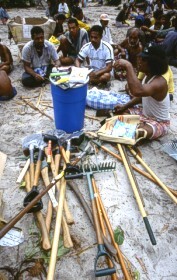 On reaching the beach, we found that most of the island's population had gathered for the distribution of the long awaited sago palms they use to thatch their huts, which had arrived on a ship the day before. As everyone was already assembled, using a loud hailer I introduced ourselves, and told everyone what we had brought, and who it was from, and that we would unload everything the next morning. That afternoon we had to follow the protocol and had a 4 hour meeting with the 4 Chiefs to discuss how the goods would be distributed. We were both pleased when it was over - sitting cross-legged and rubbing noses with everyone in sight gets a bit wearing after a while! At 8am Friday morning we commenced unloading the supplies into the canoes and into Don's dory. There was a bit of shock and amazement as the boxes piled up onto the beach, as to how much could come out of what appeared to be a relatively small vessel! The island committee decided how the goods would be allocated, which comprised of 28 Pickfords boxes (tea chest size, which were kindly donated by Pickfords). These were stuffed with mens, women, kids clothes, towels, sheets and cooking utensils. 4 large tea chests - 1 for each of the Chiefs, numerous boxes of school books, pencils, paper, blackboards, sports equipment for the kids, snorkels, masks, school desks, 8 large reels of thousands of feet of fishing line, tools comprising of adze, axes, spades, mattocks, saws, chisels, hammers..etc,etc.. The list goes on, but altogether 161 packages were landed on the beach. On the Saturday morning, representatives from the 8 churches gathered. 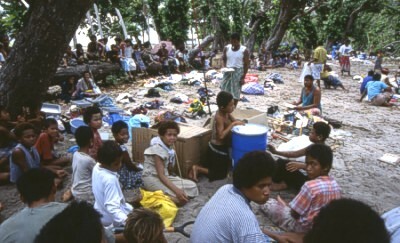 The boxes were unpacked and the number of households in each parish had a selection of everything. I was very pleased how it was fairly divided, and everyone was very appreciative. On Monday we undertook the job of assembling the Lucas portable saw mill, which was to be used by the island until they had processed their fallen logs. It was not without its moments, but we got it up and funning for them. 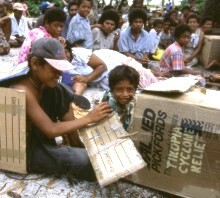 Contrary to what you read and hear, ours was the first lot of practical supplies they had received. Many so-called donations of equipment and money have never arrived. 4 vessels had been before us. 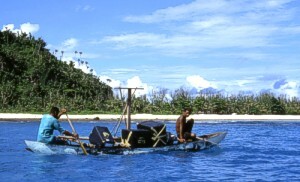 The first was the Solomon Island patrol boat with black plastic, plastic buckets and rice. Another Solomon cargo vessel arrived with more rice, the first of the sago palm, and materials to rebuild one of the schools, which has been donated by the EU. 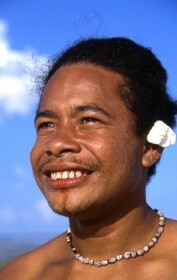 Next was the 'Tahiti Nui' which sailed direct from Tahiti. They brought bottled water, flour, rice and corn beef. They, like us, refused to go to Honiara. The 4th vessel was a Solomon Island cargo vessel which brought the last of the sago palms, materials for the 2nd school, rice and beetle nut. I could not see any sign of the hundreds of thousands of dollars that had supposedly been spent to buy help for them. I was told by the Honourable Walter that Aus Aid paid for the sago palms, and the EU paid for the schools. The clinic had extremely limited medical supplies (basically a few syringes and plasters), and was in desperate need of a rebuild. Though no-one is dying of malnutrition, a boiled rice diet is certainly bland after 5 months. They are catching a few fish, but not enough for everyone. Thankfully the soil is so rich, and within a couple of months the root vegs should be back. Unfortunately it could be up to 10 years before the coconuts have produced, and 10 years before their tapa trees are mature. 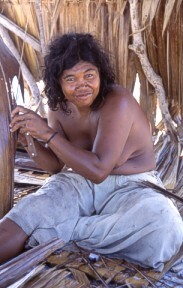 (Tapa is a fibre that they make from the bark of the trees, and apart from tumeric, is their only cash crop). Tapa is like heavy parchment, and is used for their traditional dress. 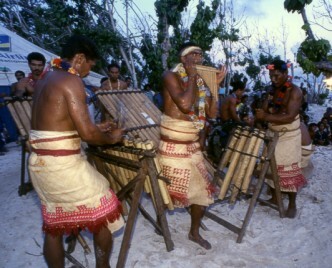 They do not adorn it with designs as they do in Fiji and Tonga. Luckily, the springs are still running, and they do have water. A basic gravity system was introduced by the British Govt before independence, and this provides one tap to every 3 households. As one walks to the windward side, the only way to explain it is that it is like the pictures of a 2nd World War battle scene, as the marines arrive on a beach that has been shelled by heavy armour. 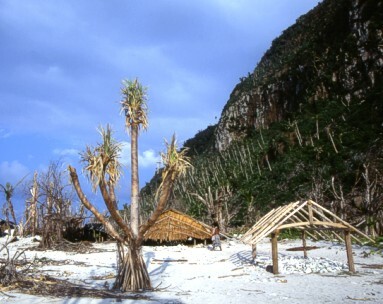 Palm trees reach skyward with shattered trunks - large trees lie uprooted and coral and sand is piled high. 5 months after the cyclone, most households are still living under black plastic - you can imagine the heat under this during the summer months. Everyone went into the sea to cool off during the hottest times. This has caused chronic chest complaints, and pneumonia. Of course there are no antibiotics, so all the kids have runny noses and breathing problems. They also have no energy or stamina to run or play. Ulla also took photos of the eyes of 4 of the old people whom we suspect had cataracts. 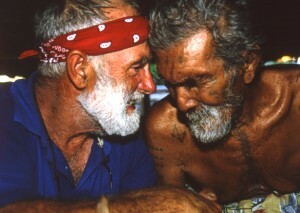 Hopefully an eye team will be able to visit the Solomons later in the year (Project Marc), and with luck after a quick 5 minute operation, the elders will regain a fair bit of their sight. It was a hive of activity as family groups worked well into the night to make the thatch for their traditional huts, which are usually about 12-15 metres long, by about 5 metres wide. They have heavy wooden pillars and beams which support the roof structure, and this is then thatched over with sago palm. 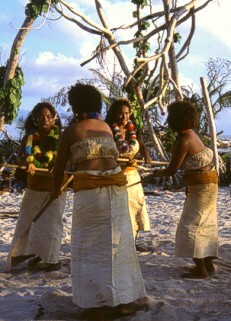 The sides are also thatched, and these are lifted up to allow the cool trade winds to blow through. 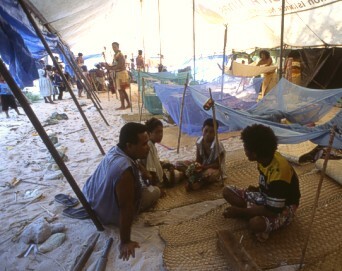 Coconut mats cover the floor, and pandanus mats are used for sleeping. 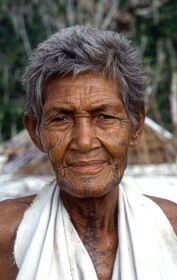 The windward villages have lost not only their day to day belongings - they have also lost their ancestral graves and family heirlooms, which are a major part of their traditional culture. This has caused them great distress. 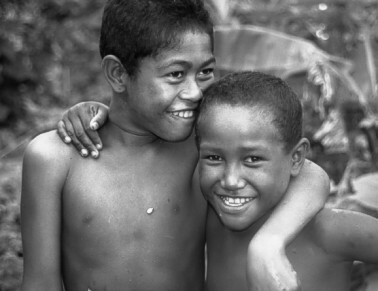 The only outside help they have received is from a group of 30 young people who are of Tikopean ancestry, whose parents were moved to San Cristobel in the '50's and '60's when the island was over populated. These young people are part of a dance group, led by Gregory, the nephew of Walter Manning (he is one of the oldest people on the island, and can remember an American bomber crashing into the sea in WW2, and 5 of the crew were rescued by the islanders in their canoes). The group have been sponsored for the cost of their food and passage by the EU, who are trying to stimulate the people after the severe stress they have endured. These young people work rebuilding the houses and making the thatch, and in the evening, they put on traditional Tikopean dances and make incredible music with a bamboo thong band and pan pipes. They are the one ray of hope and energy in the whole sorry scenario. They are a credit to themselves and their leader Gregory. It would be wonderful if they could be sponsored to come to Australia for the Pacific Festival, to raise funds and awareness for the island. 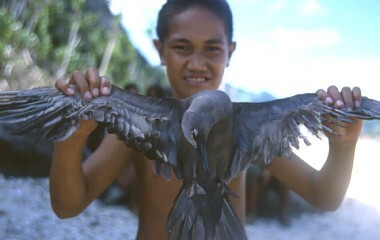 Ulla has some great footage of them, so you should get to see them on the video. The Chiefs invited us all for a thank you feast, and we were smeared with tumeric mixed with oil, which is one of their traditions. Unfortunately it tends to get on everything, but after a good scrub we were reasonably clean. The one thing they do have growing in profusion is water melons, and this formed a major part of our diet while we were ashore. Deb tells me I have lost my bum while I was away, and complains that it was a pity it wasn't hers! 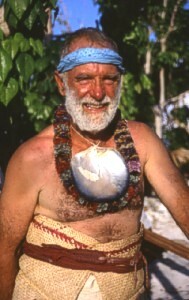 Don dropped Ulla and I off at Santo, in Vanuatu, and continued on to Lautoka to reload his belongings. I would like to thank everyone that contributed - at times we were overwhelmed by people's generosity, particularly as many people had never heard of Tikopea prior to the cyclone. Rod and Stella for organising and packing all the supplies. This was a much bigger job than we all envisaged. Also Amelia and Rowan for their labelling skills. And also not to forget the many people who collected clothes and goods in Sydney, Brisbane and Mt Tamborine. These include Trish, Joe, Miranda, Spider, Dennis, Phillip, John, Keith and Maggie and Lynne and her network of Tamborine Mums. We can't name everyone, but I can assure you of our heartfelt thanks. If anyone has inadvertently been left out, please accept my apologies. As many of you are aware, doing things in the islands is not without its challenges, and as you can imagine there are many untold stories not mentioned here. However, I am very proud of the effort we all put in to make this such a success. Without everyone working together it never would have happened. If things had been sent through the normal channels, who knows how much would really have arrived. In a few weeks time, we hope to have a small video and CD rom available so you can see for yourselves. Please contact me if you would like it. Total funds raised was in excess of A$10,000.00 - not to mention all the donated goods. The small amount left will be sent to the Austn High Commission in Honiara to be deposited direct into the island's bank account. Thank you all again for a sterling effort. It is wonderfully heartening to know that the generosity and spirit of our "EOTW Family" still continues, as well as our fellow sea-farers.